[New for 2017] We all remember I don't like coffee ice cream right? 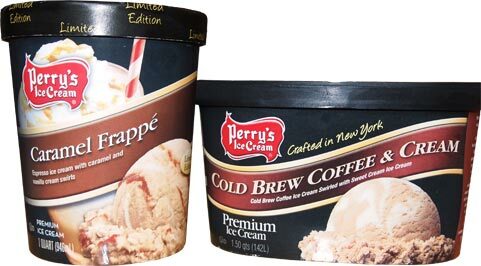 Ok, good, please keep that in mind going forward as I do my best to showcase two new coffee flavors that Perry's sent over for testing. The caramel one is from February and the other is from April. Yes I know it's June. 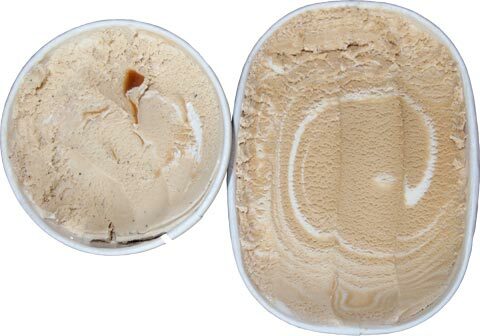 Limited edition Caramel Frappe is espresso ice cream with caramel and vanilla cream swirls. 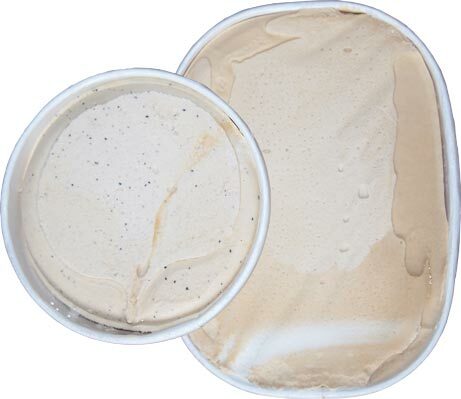 Full time Cold Brew Coffee & Cream is cold brew coffee ice cream swirled with sweet cream ice cream. It sounds like neither one should be a straight up ice cream flavor so this will be a battle of which one is sweeter and less robust. but Frappe seems to be rocking coffee bean bits (left). Cold Brew is a little bit harder to scoop (though it is a larger container) and it's just a little more brown. It also has that neat and distinctive swirl pattern you get from mixing two ice creams while frappe has that more random look from it's swirls. Oh, owww, wow, cold brew doesn't hold back any punches. That is straight up coffee through and through. I think one bite is enough on that one. That is easily one of the most straightforward coffee flavors I've ever sampled. There is that bold coffee note on the end of the frappe flavor, but it's at the forefront and never ending on the cold brew flavor. I'm going to attempt one more bite. I can do this! ...no, no I can't, cold brew is like licking coffee beans. I mean that in a nice way. On no planet is this flavor for me. And there you have it. If you like your coffee strong and black, go cold brew. If you like a lot of milk and sugar in your coffee, go with the Frappe. Thanks to Perry's for sending these over as it was still fun comparing the two.